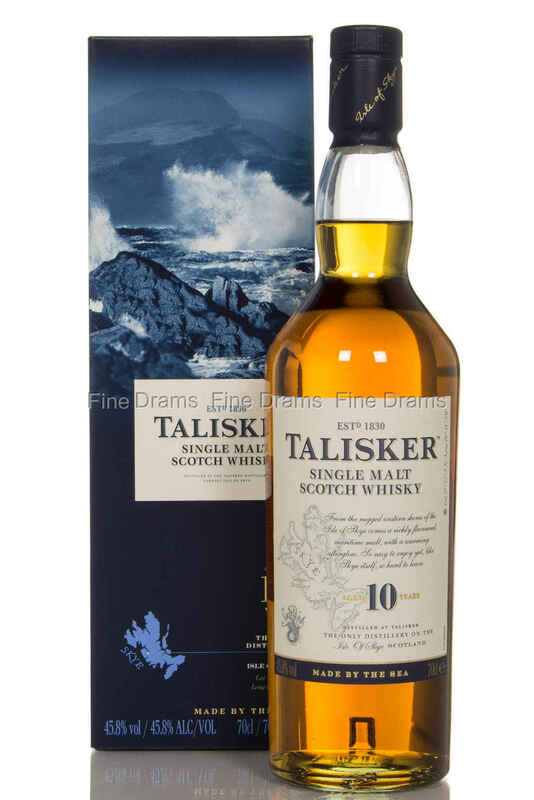 A true iconic of Scotch whisky, Talisker 10 year old is the entry level malt from the famous, and highly regarded, Skye distillery. Talisker 10 is considered, by Diageo, to be one of the 6 “Classic Malts of Scotland”, representing the Island region. This is an extremely coastal whisky, rich in the flavours of the sea, and influenced by the distillery’s location in the wild North Atlantic. The bottling showcases the traditional Talisker profile, with a medium peat, plenty of white pepper spiciness, some fudgy toffee and slight seaweed notes. Talisker 10 is bottled at what is considered classic Talisker proof: 45.8% ABV, a strength that seems to really suit the distillery’s spirit. A must-try dram that is a crucial step in every drinker’s whisky experience.